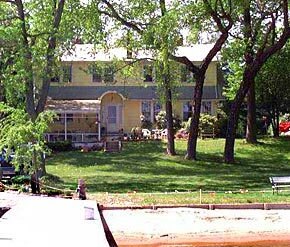 North Bay Bed and Breakfast, a very special waterfront B&B on the Chesapeake Bay inMaryland. An outstanding water front Bed and Breakfast with a touch of the Florida Keys, located in North East, Maryland at the headwaters of the Chesapeake Bay, offering sailing lessons and charters. Pam brings to North Bay her attention to detail, creative flair, and culinary expertise. North Bay is an expression of her love of waterside living, fondness for a genteel, unhurried lifestyle, and the desire to share the blessings of the Chesapeake Bay. 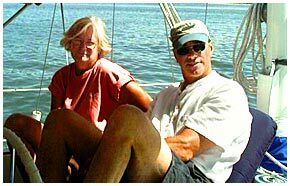 She shares her passion for sailing with her husband and enjoys the opportunity to go "cruising" with guests on overnights down Bay, in the Keys and in the BVIs. Her skills in the galley insure a well-fed crew. Outside of her activities at North Bay and as mate aboard their 50-foot sailboat Journey, Pam has been involved in church outreach programs. Her number one activity, aside from interacting with guests, assisting Bob with the boats, looking after their one cat, and maintaining the Bed & Breakfast is watching the FoodNetwork. This translates into great breakfasts for our guests. Bob left the corporate world after 12 years to pursue a consulting carrier in adult education. He is a Master Trainer in over 20 diverse programs including Team Building, Creative Thinking, Problem Solving, and Project Management. He is an accomplished motivational speaker. His 40 years of sailing have lead to his earning a 100-ton Coast Guard Masters License, a US SAILING instructor's certification, and a Maryland Safe Boating instructor's certification. Combined with his experience as a yacht delivery captain and sailboat rigger insures your comfort, safety and relaxation while on the water. Bob's appreciation of nature, history and his knowledge of the Chesapeake Bay area provides an insight into the many sight seeing and lifestyle opportunities that are available during your stay at North Bay. Their daughter and son-in-law operate Haven Charters out of Rock Hall, Maryland, a full service bareboat charter company specializing in Chesapeake Bay and Caribbean charters.